Seven miles separate Scappoose from St. Helens, a 10-minute drive on Highway 30. The gap between both schools' boys and girls cross country teams, judging by recent results, might be even smaller than that, creating a fun-filled competition as the programs turn their attention toward the Class 5A Northwest Oregon Conference district meet, which will take place Wednesday at Blue Lake Park in Troutdale. The St. Helens boys beat Scappoose, 24-31, and the Lions girls won 22-33 in a four-team meet on Oct. 10 at McCormick Park in St. Helens. n St. Helens junior Waylon Nichols won the boys meet in 17 minutes, 39 seconds while Scappoose freshman Luke Suchoski took third overall (18:39). Indians junior Josh Lull ran a season-best 18:48 to take fifth and was followed in by a trio of Lions: juniors Cooper Montgomery and Evan Garrison and senior Cash Lapping. "It's a friendly rivalry," Scappoose coach Kevin Pinkstaff says of the Indians-Lions boys cross-country matchup. "A lot of the athletes know each other well. A few of our athletes have lived in the St. Helens area. "We're friendly and on good terms, but on the course they're the first team we want to beat, and same with them. That's a good thing, and it brings out the best in our kids and their kids as well." Suchoski's twin, Rowan, didn't run against St. Helens. They are Scappoose's top two runners and were paramount in helping recruit newcomers. According to Pinkstaff, St. Helens has been "a bit of a target" for Scappoose this season because the Indians competed against them fairly regularly over the years despite being in a different classification, with Scappoose at 4A. The boys programs split their first head-to-head meetings this season. "It was a little disappointing to come up short against them, but a lot of our guys had good races," Pinkstaff says. Lull started out slowly Oct. 10 against St. Helens after getting tripped at the start of the race as some of Scappoose's junior varsity team jumped ahead of him. But he kept pushing, made up a ton of time. "When he came up out of the woods, I was really surprised he was as far up as he was," Pinkstaff says. Pinkstaff says Wilsonville has a "really strong" program and should be a favorite not just at district, but also at state, which will take place on Nov. 3 at Lane Community College in Eugene. Pinkstaff says taking down the Wildcats might be too much for the Indians this year, though a bid to the 5A meet isn't out of the question. Scappoose, St. Helens and La Salle Prep are expected to contend for third at district and an automatic state berth. "If we give them a good day, we have a shot, and that's what our focus will be," Pinkstaff says. Through Wednesday, Nichols ranked fourth in the NWOC with his best time of the year a 16:52.5. The top three: Parkrose junior Ahmed Ibrahim (15:21.0), Wilsonville senior Jack Burns (16:45.8) and Wildcats freshman Jacob McClelland (16:48.4). Rowen Suchoski ranked 12th, with brother Luke 16th. St. Helens' Montgomery was 20th. n The St. Helens girls team wasn't at full strength at the Sept. 5 NWOC Preview, but with Mackenzie and Cheyenne Trainer back in action, the Lions should be one of the top teams at district. The twins took first and second overall in the Oct. 10 race against Scappoose, with Mackenzie finishing in 20:55 and Cheyenne 21:27. 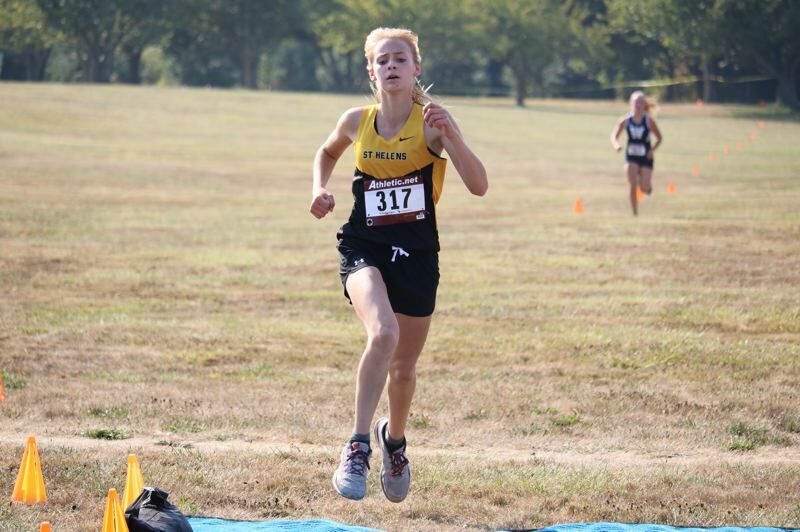 Lions freshman Hannah Hayduk was third (21:59), and St. Helens senior Kaitlyn Silva was sixth (23:33). Scappoose freshman Sydney Hanke ran most of the race by her lonesome, just behind the Lions trio and well ahead of the next wave of runners. Hanke placed fourth (22:03), and Indians senior Anne Morud ran 23:22 for fifth. The Indians girls had just three returnees this year. One of the newcomers is Etosha Lopez, a junior who kept the gap tight in the second pack of runners at McCormick Park. Lopez finished seventh overall and has assumed some of the team's leadership duties along with Morud and senior Audrey Demeaux. Scappoose freshman Elise Briscoe, 13th overall on Oct. 10, has a lot of "long-term promise" as a runner and is getting stronger mentally and physically, Pinkstaff says. This fall has been a boon for the Scappoose girls squad, considering the Indians were trying to fill a team just a few months ago. "We've had a history of strong performances, and I want to get back to achieving at that level again as soon as possible," Pinkstaff says. "We've made a good step toward that this year, and we can keep building on that." Through Wednesday, Hanke ranked 12th in the NWOC, and Morud was Scappoose's next-highest runner, ranking 28th. For St. Helens, Mackenzie Trainer ranked fifth in the conference, Hayduk ninth, Cheyenne Trainer 16th and Silva 21st.